Are you having a karma emergency? Is there a pattern of bad luck that is completely wearing you down? Maybe you keep losing opportunities to make more money. Maybe your online search for love keeps blowing up on you. This can be very draining, and you must stop your suffering now. It’s time for an Emergency Karma Clinic. Dr. Ganesha is on call and ready to remove your biggest obstacle as quickly as possible. Dr. Pillai has identified a very special Ganesha temple for fast and powerful karma removal. This is a set of ceremonies performed just for you. “There is an emergency; you have to bring emergency to stop your suffering, whether it is financial suffering, whether it is physical suffering, a disease, or a relationship suffering. You have to stop it immediately. You have to create an emergency, and that is important. Otherwise you will be waiting forever, and you elect to suffer and it is foolish to elect to suffer. So, the Emergency Karma Clinic uses a lot of symbols and ceremonies. And that’s the reason why I created this Karma Clinic and I want you to try. It is again a scientific process. We have to test it and I want you to test it; just not once, just give it 2 or 3 times before you drop it or keep it. Your personalized Emergency Karma Clinic ceremonies are designed to bring total change in your life, which is why they are performed only on 4th Moon or 14th Moon days, Ganesha’s powertimes. These ceremonies are scheduled on a first come, first served basis, so read more about them below and reserve your spot today. The Fire Lab is considered the most powerful of all spiritual technologies. It specializes in amplifying and materializing the benefits of mantras (power-sounds) at rapid speed, and is the primary medium through which you can benefit from an Archetype. This Fire Lab will be performed solely on your behalf at a Ganesha powerspot chosen by Dr. Pillai. Coconut smashing is considered the most powerful karma removal technology, first discovered by Ganesha after asking his Father, Shiva, for the most powerful way to sacrifice karma. Shiva said smashing a coconut was equal to sacrificing Shiva Himself, the Supreme Divine Being. 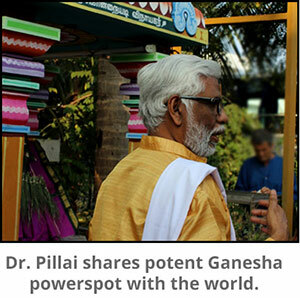 1008 coconuts will be for you at a Ganesha powerspot in India chosen by Dr. Pillai. Image worship is a technology which facilitates the energetic ‘darshan’ (radiation) of a Divine Being on the earth plane. This darshan can transcend time and space and transmit Ganesha’s energy directly to your soul. This ceremony will be performed on your behalf at a powerspot chosen by Dr. Pillai. Wear the combined energies of Lord Shiva and Goddess Parvati, promoting spiritual and material abundance. The attached Ganesha pendent keeps Ganesha’s powers close at all times. I want to thank you for your helpfulness, lovingness, compassion, kindness, radical humility, generosity and open heart, and for being a Servant of the Lord. I purchased the Emergency Karma Clinic for our son Jayson almost a year ago, in August 2017, while he was living at home for the 2nd time. Since the emergency karma program, he has received raises and purchased his first home about May of 2018.